Meanwhile, I'm not one for thumb-twiddling, so I look around. Thus, I'm on Twitter and Yahoo! Pipes. Yahoo! Pipes is simply fascinating, and I regret that I only started playing around with it over a year after its launch. If Google ever considered purchasing Yahoo!, Pipes was likely on its list of Pros. The concept behind Yahoo! 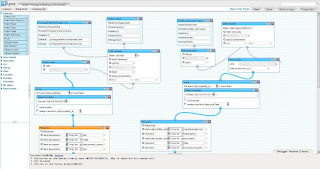 Pipes is simple: you stitch together various elements and transform data as it travels from one end to another. All this is done via a neat AJAX interface. Like Unix pipes, simple commands can be combined together to create output that meets your needs. I started on Pipes by combining Twitter JSON feeds and RSS from Prologue-themed WordPress sites, e.g. psyku.tk. It was a pretty interesting exercise, and you can see the results in my "Twitter + psy//ku" widget box. I'm sure I'll be working on more pipes as time allows. Check them out at pipes.yahoo.com/ibrado. ** Feb 26. I now have Mashups access.